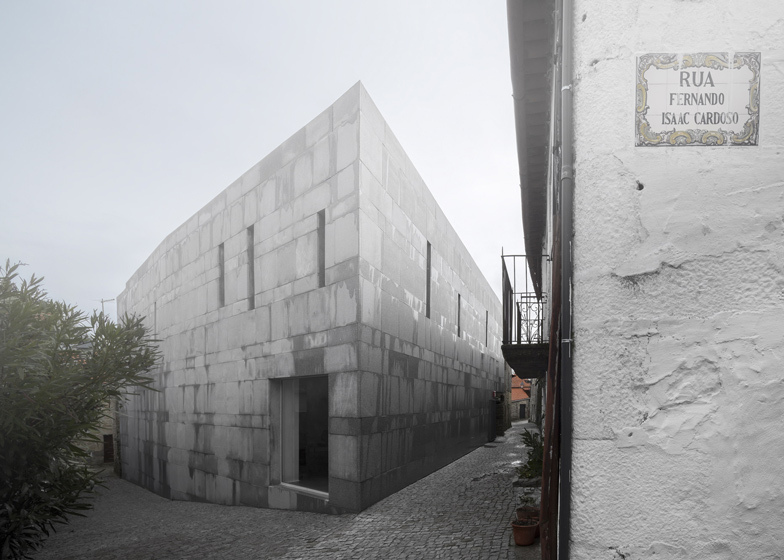 Lisbon office Gonçalo Byrne Arquitectos has designed a Jewish cultural centre in the historic heart of Trancoso, Portugal, with a sharp corner that bisects two narrow cobbled streets (+ slideshow). Gonçalo Byrne Arquitectos teamed up with Oficina Ideias em linha to develop the Center for Interpretation of Jewish Culture Isaac Cardoso on a derelict corner plot in the heart of the city's densely packed medieval streets, which were once known as Trancoso's Jewish quarter. "Starting from a ruined allotment, the aim was to re-erect a building that reinforces the corner geometry, still displaying an acute angle on the intersection of two narrow streets, and establishing a symbolic gesture in the context of Jewish urban culture," said the architects. The building's outer surfaces are covered in a seemingly haphazard arrangement of granite slabs, with narrow windows allowing restricted views of the interior and adding to a feeling of solidity that echoes the construction of its traditional neighbours. An entrance on the building's west facade leads to a lobby and a narrow corridor that encircles a central room called the Master Pit. "The massive character of the building is also reflected on the interior design and 'excavated' spaces, like a sequence of voids sculpted from within a large stone monolith," the architects explained. The double-height room at the building's core acts as the main religious space and is influenced by historic Jewish synagogues. It contains a raised platform with a lectern for readings and a nave with wooden shutters. A long aperture high up on one wall allows people on the upper storey to look down into the worship space. 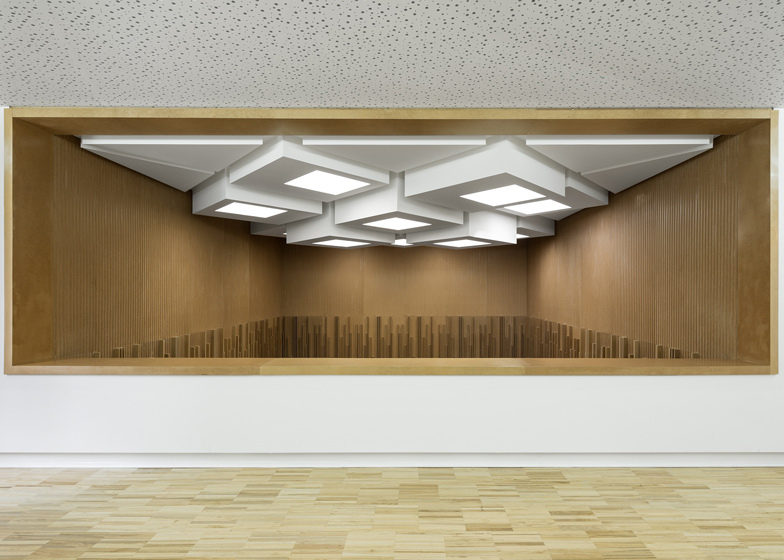 A geometric pattern of boxy skylights channel daylight into the central room, which is completely clad in panels of wooden strips that give the space a warm tone. The wooden cladding features relief decoration that accentuates the height of the space and is also used on the nave to create the appearance of columns and an arch. The pointed corner of the centre contains an exhibition room with a large, low window facing the street. A projection room is tucked away at the rear of the building, while the upper storey is used as a women's room and additional exhibition space. Bathrooms and technical facilities are contained in the basement. The Interpretation Center was plotted in the dense urban fabric of a medieval fortified village, in an area once referred as the Jewish quarter of Trancoso. Starting from a ruined allotment, the aim was to re-erect a building that reinforces the corner geometry, still displaying an acute angle on the intersection of two narrow streets, and establishing a symbolic gesture in the context of Jewish urban culture. Altogether, the irregular granite slab stereotomy and tiny fenestrations define the elevation towards the two confining streets. The massive character of the building is also reflected on the interior design and “excavated” spaces, like a sequence of voids sculpted from within a large stone monolith. For the exception on this sense of mass, the building is provided with the existence of a large glazing which allows visibility over the Master Pit, a core that enhances all the Jewish culture symbolism with the presence of water. The excavated granite mass, where the openings are also crafted with a special plastic approach, prevents overall perception of interior space from the outside, also controlling lighting, recreating and reinterpreting some of the most expressive features of Jewish Architecture in Beira Interior region. The main room, which refers to the sacred space of the Sephardic Synagogue and the Synagogue of Tomar (also in Portugal) has the most obvious inspiration, rising in the stony mass of the building on all its height, filtering the sunlight to the inside through a ceiling where the complex geometry veils and shapes the perception of all sacred space. This area differs from the others not only for its size, but also for the lining of the vertical strained panelling in glazed wood, providing an inner atmosphere bathed in golden light. The religious space is dominated by the texture and the sense of rising by the wood cladding of the walls, giving it a temperature and a particular colour and smell. 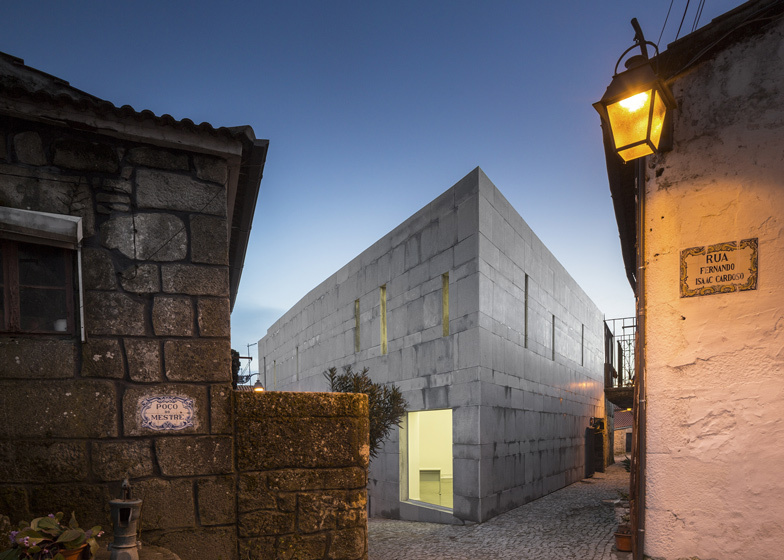 Given the small size of the building, unique geometry and privileged location within the urban medieval tissue of Trancoso, the option pointed towards one outer shell is insulated and coated with granite slabs providing a ventilated façade solution. The structure of reinforced concrete column / slab, with walls filled with brick masonry is fully lined, on the inside, with walls and ceilings of acoustic control plasterboard. Outside paving and coatings have the same nature, made with regional granite slabs, keeping the colours and textures of the urban environment inside the fortified village and castle guard.